There is no Walter White. There is only Heisenberg. This whole season, well, the whole series really, has been about the transformation of “mild-mannered” Walter White into the meth kingpin Heisenberg. This week, we got another piece of a puzzle we didn’t even know we were building, or a glimpse into the psyche of what really drives Walter White. Part of what made us root for Walter in the beginning was the feeling that despite all the horrible things he was doing, it was for a good cause, or at least out of self-preservation. He was a good man who got a bad rap. Then he got cancer, and as Jesse points out, he wanted to cook meth in order to secure $737,000, which would set up his family for life. But this new information puts things in a different light and helps explain why Walt tries “so hard to not make five million dollars.” As well his describing that amount as “nothing” and “pennies on the dollar.” And, of course, why he works with an almost animal instinct to burn off his handcuff, steal the methylamine, and calmly tell Mike that everybody can win, you know, with a gun to his head. By taking the Grey Matter buyout, Walter gave up the opportunity to prove to the world what he’s known all along: that he’s just plain better than the rest of us. 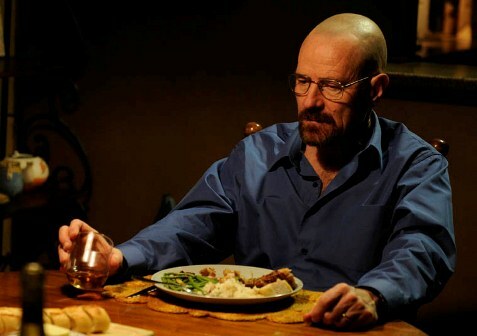 In the pilot, Walt saw the tremendous amount of money to be made by cooking meth during the news report on Hank’s bust. With his introduction to Gus Fring, he saw just how far one can go in the meth business, and learned some lessons about how to get there. There’s no way Walter will take the buyout, to make that same mistake twice. While it seems Mike has forgotten his own advice about “half measures” (how many times has he had a gun to Walt’s head now? ), Walt has not. He’s going to make himself forget Grey Matter ever existed. He’s going to make all the money there is to be made. But I believe he has simply come too far. All the money in the world wouldn’t satisfy Heisenberg, and that’s why he’ll go out with the bang that was hinted at in this season’s first scene. I can’t say I’m certain what Walt’s plan is going to be. How can everybody win? He’ll cook by himself and then pay off his partners? But they want their money and they want out. Now. There’s no time for such things. Based on some small hints in this episode, listed below, I’m thinking the plan might have something to do with putting out fake blue meth. -Over the wire, Mike overhears Hank going about his new responsibilities at the DEA. One of his conversations is about the difference between mayonnaise and its imitation, Miracle Whip. -The TV report just prior to the one about the boy Todd shot was about a caviar knock-off made of kelp. One last thing: after that news report, Walt tells Jesse that he’s lost sleep over the boy’s death and tells Jesse to go home, saying he will finish the cook on his own. When Jesse returns downstairs Walt is whistling a startlingly upbeat tune, and you can almost see the gears in Jesse’s head start turning. Walt doesn’t care about the dead child. What else has he lied about? Maybe his mind even goes back to his original (and ultimately correct) suspicions that Walt poisoned Brock. Then there’s the imagery, standing outside of the tent listening to Walt whistle, Jesse is quite literally on the outside looking in. Watch the cast and crew go inside “Buyout” below and follow the writer on Twitter @NateKreichman.